We'll start with the good news, the Houston Dynamo clinch their third straight playoffs berth thanks to Saturday's 3-1 victory over the Colorado Rapids. Up next for the Dynamo is a CONCACAF Champions League match against San Francisco FC at Robertson Stadium tomorrow night (Tuesday Oct. 7) at 9:00 pm cst. The Dynamo are selling ticket packages - $45 for 4 tickets. 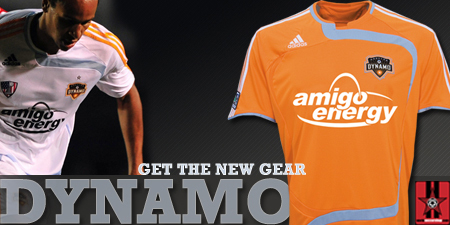 This will be the Dynamo's first home game since Hurricane Ike. On Sunday they host DC Unitd and kick off a week long effort to raise money and soccer equipment for local youth soccer clubs that were hurt by the storm. Now the bad news, at least for me, Roma dropped another game this weekend losing 1-0 to Siena. Meanwhile, Juventus lost to Palermo, 2-1, Inter beat Bologna, 2-1, and Cagliari held Milan to a 0-0 draw. Lazio only managed a 1-1 draw against Lecce, meanwhile Fiorentina beat Chievo Verona 2-0. Just when it looks like things are starting to gel for Roma, the lose a match. I still think Spalletti should be given more time, but I know how things go in Italy and his job might be on the line. Maybe it is a good thing this weekend is a FIFA break. I'm thrilled to see that Bradley has called up Altidore and Torres for the upcoming WQ Matches. I'm really interested in seeing Torres get his first cap for the USA. Meanwhile, Guiseppi Rossi has been called up by Italy's Senior team.